It was an honor to be back at my Alma Mater, Longwood University in Farmville, Virginia to participate in the 2016 Virginia Children’s Book Festival. I collaborated with my great friend, TODD PARR! Todd is a San Francisco Bay Area children’s author and illustrator, who reveals about himself, ‘I like fog. I like the sea lions and the dolphins. I like to paint. My favorite color is blue. My favorite food is macaroni and cheese.’ The VCBF is pleased to have Parr return for the third year and I am so honored to work beside this amazing human being! 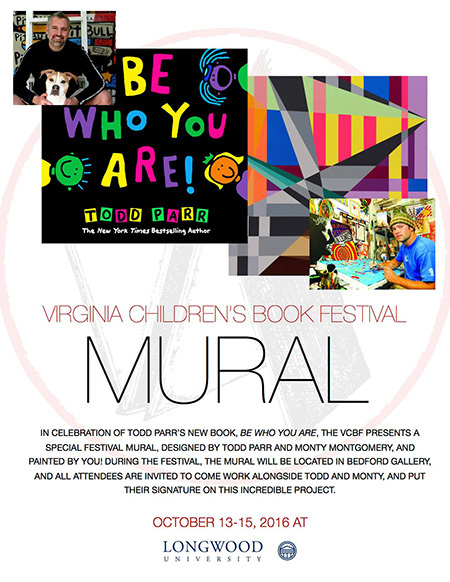 Over the three day festival we created a “LIVE” mural using many of Todd’s characters combined with a feel of my various series of works. The coolest part of this mural is that the kids and adults at the festival created with us! A total group effort which will bring a positive message for our youth and be filled with amazing energy for everyone! The “LIVE” collaborative mural came to life in the main gallery of Bedford Hall October 13th through 15th on the Longwood University campus. The mural was displayed at Centra Southside Community Hospital for a couple months and will now be dedicated to Virginia’s children at it’s permanent home, the Children’s Hospital of Richmond. It was so awesome creating with kids from all over the map. The VCBF is always looking for helping hands, physically and financially. Their mission, as Juanita Giles, executive director, reminds us ‘is to create a culture of literacy in our region in particular and our Commonwealth at large. Visit www.vachildrensbookfestival.com to see how you can help!